Sometimes a single image can convey a complete story. We have a beautiful example of this, in this petroglyph. It is an ancient story, told in an ancient way, by an ancient people. Yet this image, this story, transcends the time and culture that made it. It is a story that is still told around a few campfire today, perhaps not as often as it should be. It is the story of a good kill gone bad. A story that may have played out on this very spot. To the particular hunter, that threw his spear and killed this particular sheep, we can begin to understand this story by reading the various attributes in this glyph, and understanding its placement in time and the environment. To start with this petroglyph is probably very old. If we look at the size and length of the projectile that killed this ram, it's most likely a spear or ‘dart’ thrown with a atlatl rather than an arrow, indicating this happened before the invention of the bow and arrow. Then if we look at the placement of this projectile, it seems to indicate that this ram was above the hunter and facing him when he got hit. The placement of this glyph is next to a small water source at the bottom of a small rocky canyon. From the water source to the rim of the canyon is well within the range of these ancient weapons. Taken together, the shot placement shown in the petroglyph, and the glyph placement itself, can be interpreted as evidence that this event took place at this glyph site. Now if we look at the artistic style of this petroglyph, it is a classic Coso range bighorn sheep, this artistic style is sometimes referred to as a boat sheep due to the shape of their bodies. However there are two significant differences in this particular glyph, the first and most obvious is that this ram is upside down. Then if we look at the back, it’s curved outward. Most Coso sheep have a straight back. This would seem to indicate that not only is this sheep dead, but it's bloated as well. There is one other important artistic detail that would seem to indicate a bloated condition. If we look at the back end of the sheep not only did the artist draws a short tail which sheep have, he also drew in what seems to be excrement squirting out it’s body, this phenomena is common with dead bloated animals. So what is the story here? How much imagination is required of us to connect the dots, and what can we learn from this ancient glyph? We can start with the fact that desert bighorn sheep can go a month or two without drinking water in the winter months. They get all the moisture they need from the plants they eat if conditions are right. So if this ram was at this glyph site to drink the water, it was most likely in the hot summer months. Of course this is also indicated by the bloated condition of this ram. As large animals like this will bloat and rot very quickly in the summer time heat, and this same process takes quite a bit longer in cold weather. So when there’s water next to this glyph in the summer time, we are likely to have the bighorn sheep and the hunters as well. Now let’s explore one scenario that fits the attributes of the glyph and its placement in the environment. We can start this story with 3 or 4 hunters coming to this small canyon and selecting a place to ambush the sheep. They would’ve selected a place based on their own preference and the pecking order within their tribal group. Having been at this site myself it’s my opinion that this glyph site would’ve been a preferred site. Using traditional tactics, it’s most likely that all of these hunters entered their hunting blinds under the cover of darkness and began to wait for the bighorn sheep to come to them. Having watched bighorn sheep around springs and other water sources myself I know that at 9 or 10 o’clock in the morning is often one of the high points of sheep activity around these water sources. As this hunter sat their crouching by this water source, this bighorn ram literally stuck his neck out over the rim of this small canyon and our hunter immediately threw his spear and hit this ram in the chest. Though fatally wounded, the ram took off running. A hit like this will kill, but not immediately, like a shot through the lungs or in the heart. This ram might have run a long ways before it died. Normally the hunter would’ve gone in hot pursuit of his quarry and butchered it immediately by opening up the body cavity and gutting it. This would allow it to cool and began to dry and not rot or bloat. It seems in this case this did not happen. One of many possible reasons for this is, that the other hunters having seen the animal get hit, thought that would not go far. However, they may have been waiting for other animals to come in to try and get a drink of water, and they had to remain hidden. So if this one hunter had broken cover and start to run after his ram he would have scared off the whole heard. Instead of getting 3 or 4 sheep they would only gotten one. So they all stayed hidden for another 3 or 4 hours and didn’t move, waiting for more sheep to come to water. Whether they did or not will never know, but it seems by the time the hunt was over or was given up, this one ram lay dead and bloated. 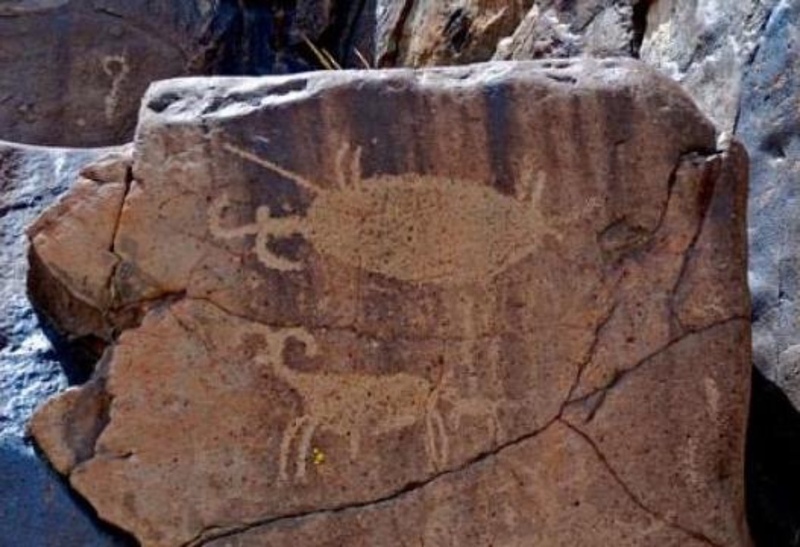 So why the petroglyph, this story in stone? It’s possible that one of the other hunters put this glyph in this man’s favorite place in order to ridicule him, and make him remember the time his impatience ruined the hunt for the other members of his tribe. Or perhaps this hunter put this glyph here himself as a way to remember something that he did wrong, the wasting of this magnificent animal and to atone for it. Of course this is just one of many possibilities based on few facts we have, but it is an ancient story, It is one that still worth telling around the campfire, especially to the young and inpatient, because there are many ways that a good kill can go bad. So it is, this glyph, this story, allows us to look deep into the past, and experience, the way of things. When in the desert, if you go dry you die. The desert Bighorn Sheep are one of the very unique species that we have in the Mojave Desert. They’re the desert's largest inhabitants, but there is much more to the species than just their size. If you have been fortunate enough to witness a large ram scurry up a an impassable mountain side, then you know what I mean. In order to understand hunting in the human way one must understand humanity's past and present and this will give insight to those who wonder about its future. In our modern day and age it is passionately debated as to whether hunting and killing are proper and useful components of human activity. Presence and awareness: This is truly one of the most fascinating subjects a naturalist can explore because it deals with both the physical the psychological worlds.